Battery App says "Charging time to full will be 9hrs 11mins" (from 20% full) + "charging rate is 8.39% per hour." 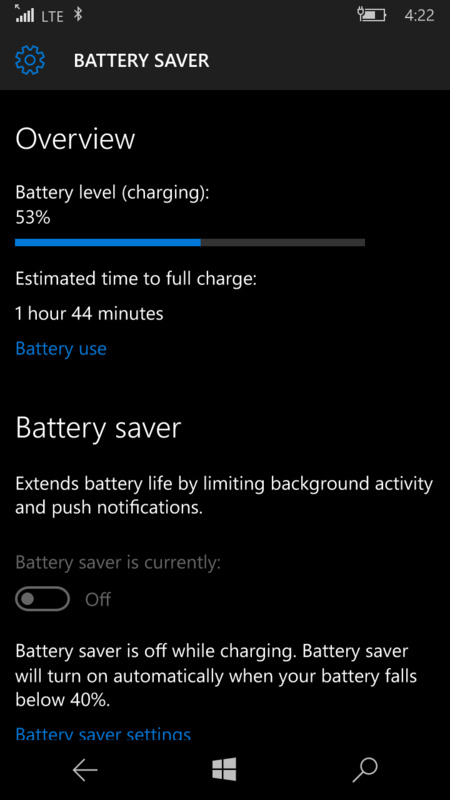 And that's using my Lumia 630 wall-charger. Not from the USB port in the PC. Am I impatient or is something amiss? Re: Charging time 20% to 100% is 9hrs 11mins on my 640? I had this issue recently with my 930, turns out it was the cable, swapped out the cable with my old 920 cable and was back to charging 35-40% an hour. However 9 hours signs that you have serious problem, either with charger, battery or charging circuit/control module. where you see how long till charged? that don't look like 8.1 so i guess there is no way in other words. i hate how people assume everyone has windows 10 preview. I don't assume that everyone has Windows 10 via Insider builds. I figure that people are going to fall into three categories. Those that need and want to test the latest software. They are running Windows Insider. Those that don't know the difference, and are using whatever their phone came with and they simply don't care. Try another charger. If your experience is better/worse/the same, act accordingly. If it's worse or the same, there may be a fault with the phone or the battery. The 640 is relatively cheap if you are stateside and bought prepaid. It may be better to just replace it. nothing wrong with my charger. i was jsut wondering about the charge time thing that seems to be in windows 10 only.